But, you know, I don't think Oy vey is quite the right phrase. My dad would certainly have said Kim git aheim. In fact, in his endearing way, he never hesitated to speak a completely idiosyncratic English that was a literal translation of Yiddish. So he'd wave off visitors saying, Come good home. "Oy vey," Markowitz said, is an original Jewish "expression of dismay or hurt." "The beauty is, every ethnic group knows it," he said, and motorists seeing it know it means "Dear me, I'm so sad you're leaving." What if I forgot to book for my hairdresser before Yomtov? Those of you familiar with normal levels of Yiddish-saturated worrying will no doubt be able to supply loads of examples of your own. Well, I always welcome a chance to express appreciation and enjoyment. And I'm only too ready to acknowledge when it comes from something I've heard via the BBC. It's just that when it comes to reporting anything to do with news about Israel and the Palestinians, I'm all too often expressing quite a lot of disappointment about the subtle and sometimes not so subtle bias and distortion I hear. So I'm really happy to tell you that this morning, BBC Radio 4 broadcast this extraordinary programme in the Crossing Continents series. The reporter, Richard Miron, spent weeks living in the former Gaza Gush Katif settlements before their final evacuation. He focused on reporting the perspectives of three settlers, one of whom was secular, one mainstream religious, and one from the messianic land-focused religious who are almost invariably represented as typical of all settlers. The programme is remarkably balanced and humane, with the reporter including comments from the Israeli secular historian and commentator, Tom Segev. Segev speaks of the way in which absurd staged-for-the-camera attempts on the part of a small number of arguably barmy families to invoke some famous Holocaust imagery misfired and turned Israeli opinion against the settlers as a whole. Miron also visits the settlers in the aftermath of their expulsion and hears from all of them that they would never again choose to live over the (pre-1967) Green Line border, because they never again want to have the experience of having to leave their homes and see them destroyed. All the settlers Miron interviews are presented as reasonable, humane people, whose disappointments and sense of abandonment are presented sensitively. He also repeatedly, but gently probes them about their beliefs, and their attitudes to the Palestinians of Gaza. One of the settlers nostalgically describes the pre-Intifada period when it was perfectly normal and natural to go down to the nearby Palestinian town of Rafah to shop and enjoy looking around. Of course, those who feel the BBC is very pro-Israel in its bias will point out that this programme fails to include any Palestinian points of view. But linked to the programme's web site is this very interesting and sensitively expressed diary piece by a Gazan employee of the Palestinian Authority. For those of you who want a more blood-curdling vision of the Palestinian future, there's this report of the latest innovation in resistance to the brutal Israeli occupation from Hamas. All I can say is, I hope they put up a "Listen Again" link for the programme. So far, they only have available their last broadcast of 28th July. Oh, and BBC Radio 4 will be rebroadcasting today's programme, at 8:30pm on Monday 3rd October. Which just happens to be after the start of Rosh Hashana, the Jewish New Year, and one of the most solemn and important of our festivals. So observant Jews won't be able to listen in. But let's not quibble about a small thing like that. Well done, BBC. Thank you for producing a sophisticated and fascinating programme. I won't even mention the nice, gentle ride you gave Nabil Sha'ath of the Palestinian Authority on the BBC Radio 4 Today programme this morning where you consistently described Hamas as a militant group (famous for its suicide bombers who set off their bombs in Jerusalem, Haifa and Tel Aviv buses and cafes). I'll refrain from comparing that with the aggressive questioning you subjected Tony Blair to later on in the programme on the matter of root-causes in Iraq and Palestine producing terrorist bombings in London, and new laws designed to deal with terrorist groups who choose to set off their bombs on London buses and tubes. UPDATE: You should be able to listen to the Crossing Continents broadcast from this link. In the Jewish tradition, when the Almighty created the world, out of ten measures of beauty that were available, nine of them were poured out over Jerusalem. 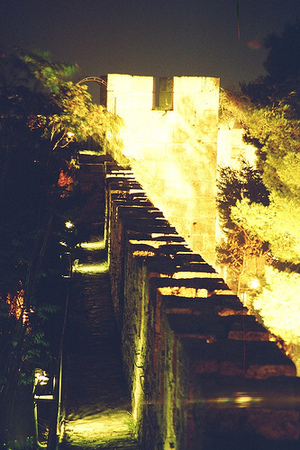 Tonight, my daughter's got up some of her first efforts at long exposure night photography from the ramparts of the Old City, an excursion which she described here. I think I can see some of where those measures of beauty fell. Here's one of her shots that most interests me. She calls it "Schizophrenic Dream"
The contrast between the well lit tower and main wall section up ahead and the sporadically lit narrow walkway immediately infront make this look like two separate photos that got printed together by mistake. It's as if you're going down a tunnel - so cool! And this one of the walkway along the wall is also slightly hallucinatory. Perhaps the exposure was longer than needed? But I love the effect it's created. Of course, these photos were obtained at the expense of some rather hair raising risk taking to get out there in the first place.... But I must snap out of this parental mode. I was new to the job. It was long enough ago that decimal coinage had only just been introduced in the UK a few months previously. And I was still in my twenties. He wasn't someone I was that keen on. He was famous for having bees in his bonnet about his pet subject. Then he had a way of fixing you with a stare and drawing his breath in through his teeth. And it did make me feel quite uncomfortable when his eyes glittered as he went on at very great length about how luxuriously dressed the rich Jews of Manchester were when he grew up there. Still, he was obviously doing his best to help me find my way in the new institution, and trying to make sure I was genned up on everything I needed to know. And, he said, you'd best avoid having anything to do with Jane. She's... well, she's not normal. And he gave me a very meaningful look. I mean, I was stunned. Tony and Jane were one of the select group of model married couples who were the only ones who got to be wardens of the campus student hostels and thus receive rather decent free accommodation. They were clear eyed and straight backed, cheerful, sporty, friendly and entirely conventional. I can't remember the exact number of children they had, but it was probably 2.4. I wondered what revelations of deviancy he was about to unleash. Yes, he said. None of the other wives can believe it. Do you know, she refuses to wash the male students' milk bottles out for them? Ever since then, I have stopped worrying about whether I can fake being conventional enough to fit in. You can never be normal enough. So you might as well enjoy being who you are. Beckerman appears to conduct what I’d call a Moral Manoeuvre in his account of the Israeli press’ supposed manipulation of public opinion. It’s based on his imposing what could be called a Mandatory Minimum Moral Entrance Fee. Beckerman’s view appears to be that unless the Israeli press consistently presents the Palestinian perspective and account of suffering in balance with that of the Israelis, it renders the Israeli press culpable. It also renders it responsible for a supposedly pathological unwillingness of the Israelis to take up the opportunities for peace that are said to be open to them. And in doing so, he singles out the Israeli press, expecting of it standards that are not evident in any other national press, least of all that of the Palestinians and the wider Arab media. Take the case of the screaming “Human Beasts” headlines in the “redtop” Israeli newspapers referred to in the previous post. Beckerman adds to this the accusation that they do not report Palestinians’ own perspectives, that if they report Palestinian casualties they are relegated to a small paragraph on an inner page, and so on. But this is no different from the press anywhere else in the world. Redtop newspapers in Britain headlined the reporting of the 7/7 and 21/7 suicide and would be suicide bombers very similarly. That’s what redtops do, and why people buy them. UK redtops don’t give in depth views of the perspectives of Iraqi villagers, or suburban Northern Irish Catholics or Ulstermen. German and French redtops are no different. Almost by definition, they Support Our Boys, the Boys being those of the armies of whichever nation they are writing for. Beckerman is never content. The Israeli papers can never be found to represent Palestinian suffering enough. So, Ha’aretz, which regularly features article after article by Amira Hass and Gideon Levy, reporting on Palestinian perspectives and claims of their suffering, almost invariably attributed by them to the Israeli occupation, is found inadequate because their reports aren’t placed on the front page. No credit is given by him for the fact that when either of them reports, the reports are always prominently linked from the home page of the internet edition of Ha’aretz. Two nationally known and renowned reporters of the Palestinian perspective are not enough. Even the UK has only one Robert Fisk to tell us about the suffering of the Taliban in Afghanistan who beat him up. Astonishingly, Beckerman is silent about the reporting of the Palestinian reporters Khaled Abu Toameh and Daoud Kuttab, which is regularly featured in the Jerusalem Post. Perhaps this is because he does not wish to consider the role of right wing newspapers. The omission is never explained. But if he is going to make a case for the culpability of the Israeli press as a whole, ignoring one of its more influential presences, especially one with a very influential internet presence, makes his case weak. In the period leading up to and during the disengagement, article after article by Khaled Abu Toameh was published in the JP focusing on the Palestinian Authority, different Palestinian factions and the individual views of Palestinians. There were also articles by Daoud Kuttab, some of which discussed Palestinian views and one which discussed the negative impact of the checkpoints on Palestinian life. There were also regular reports in Ha’aretz, Jerusalem Post, Yediot Achronot and Associated Press covering the whole of 2005 which were reporting on the statements and actions of these groups in relation to the disengagement. Very few of these articles attempted to give the perspective of Mr and Mrs Average Palestinian Citizen in Ramallah or Gaza. Perhaps this is what really exercised Beckerman. But given that the articles which were published included repeated statements by Hamas and other terrorist group leaders that they fully intended to continue their fight to recapture the whole of present Israeli territory, and statements by Abbas and the PA that they did not intend to disarm Hamas, would it have made any difference if they had? For the point is that the PA is currently controlled by Fatah, which is a Marxist-derived former Soviet client nationalist movement with a track record of chaos and corruption It is now rivalled by the growing popularity of the Islamist Hamas and Islamic Jihad groups, with their welfare networks, their funding and support bases in Syria and Iran, and their weaponry. Both groups are engaged in the election process, but both are totalitarian and non-democratic. Since they control such organizations as the local trade unions, women’s and medical charities and the like, they tend to control what can publicly be said in their own community. And typically, if you visit Palestinian blogs or web sites supporting Palestinian causes, they will tell you a pretty uniform story of the same oppression by the Israeli occupier that you will find in the reports of Levy and Hass. Solidarity trips or peace-and-friendship encounters will be carefully set up and managed to ensure that you encounter the same type of story needed to bolster the desired political line. In these circumstances, attributing the refusal of the Israelis to embrace a supposedly on offer alternative peace to emotionalism whipped up by the press seems wide of the mark. Had there been a decision in England to move 8,000 people from any city, there would have been a huge outcry. There would have been campaigns and protests, and people would have taken sides, in much the same way, though perhaps not with the same intensity, that they did in Israel. However, if a proposal had been made to compulsorily evict and rehouse, say, 8,000 English owners of second homes from Welsh language-speaking areas of Wales in order to ensure that impoverished homeless Welsh-born, Welsh-speaking citizens could be rehoused in them, there would have been no less emotional a storm in the UK. And I doubt it would have stopped at the wearing of different coloured ribbons and sit-down demonstrations. Beckerman is at his best when he draws on objective evidence to show, for example, that the televising of an incident in which settlers stoned a Palestinian child in the run up to the actual disengagement helped to raise support for the withdrawal by up to 10%. It is indeed true that the mood of the wider Israeli public fluctuated between support for and hostility to the settlers during the disengagement, as events happened, and images were transmitted. But the basic support of the Israeli public for the disengagement never tipped into opposition to it, whatever the fluctuations. And, despite Beckerman’s arguments about the complicity of the Israeli press in overlooking supposedly better paths to peace through partnership with the Palestinians, there was no great difference in the Israeli and the overseas coverage of the disengagement. It was true that the UK press dwelt less than its Israeli counterparts on the encounters between the settlers and the IDF. And they played down the emerging triumphalism of Hamas and Islamic Jihad even more than the Israeli press. But the Guardian and the Independent used the word “disengagement” almost as readily as did the Israeli press. So perhaps Sharon managed to bulldoze and bamboozle them too. The very great irony of all this appearing now from Beckerman is that there is also something of a charm offensive underway by at least one section of the Palestinian Authority to present a now idyllic face of Palestinian daily life. In early September, the BBC web site carried a report of a drive by the Palestinian authorities to show the calm and beauty of daily life in Gaza. The set of images displayed in a pop-up on this BBC web page show overwhelmingly attractive images of relaxed happy, people and places. But this life must have been there during the time of the hated occupation by the settlers of the Gaza Gush Katif bloc. It cannot suddenly have sprung into being as the last settler was moved out. So why did the Palestinians never show it to us before? An obvious conclusion is that for years, they have devoted a great deal of energy to painting an unrelieved but false image of uniformly endless Palestinian suffering under occupation. It is not that there was no suffering, or that the occupation had no injustices. But clearly, the images begin to tell us a very different story. Yet Beckerman sees no reason to call the Palestinians to account. Beckerman goes out of his way to present a lurid picture of how Israelis were supposedly converted to this deep distrust of Palestinians from their previous support of the Rabin-initiated peace process. He juxtaposes the continuous rebroadcasting in October 2000 of the killing of the young Palestinian boy Mohammed al-Durra with that of the murder of two Israeli soldiers in Ramallah to argue in quite an extraordinary way that these incidents produced parallel revulsion against “the other side” amongst both Palestinians and Israelis. Beckerman, apparently drawing further on Dor’s work, quotes the Israeli redtop headlines of the day after with Yediot Achronot’s “THESE PALESTINIANS ARE ANIMALS, NOT HUMAN” and Ma’ariv’s “HUMAN BEASTS”. He links those headlines with key articles by nationally known columnists in Ha’aretz and Yedioth Achronot which proclaimed their total disillusion with the idea of peace, and their recognition of a taste for bloodshed and cruelty on the Palestinian side. Dor’s analysis, as presented by Beckerman, went on to argue that this led in turn to a continuing amplification of the lynch story and an erasure of accounting for any Palestinian casualties. Quite incredibly, Beckerman tries to argue that it was press hysteria over terrorism that created the climate of fear that took hold of the Israeli public during the high points of the suicide bombing campaigns of 2002-2003. Apparently, Beckerman discounts the impact of the huge number of suicide bombings of buses, cafes and shopping malls that claimed the lives of hundreds of Israelis, and produced a climate of fear and horror of which this is just one graphic account. Would a lack of press coverage, and more articles about the number of Palestinians dying have made any difference? Now what is really surprising is not just the lack of moral equivalence between the two events juxtaposed. It is the omission by Beckerman of any reference to the role played by the Palestinian leadership in creating the climate in which renowned Israeli columnists could reflect an apparent decisive change of perspective amongst the Israeli public to rejecting the Palestinians as partners for peace. For the Lynch had its impact outside Israel as well as in it, and horrific as it was, its significance in shifting attitudes was arguably primarily due to the reaction of the Palestinian leadership. Firstly, in the UK, Hanan Ashrawi, then the key official spokesperson for the Arafat regime, was repeatedly featured in TV coverage I saw at the time, challenging her BBC interviewers. They asked her how it had been possible for such a thing to happen in a Ramallah police station, and what was her reaction. She declared that the soldiers were clearly undercover agents infiltrating Palestinian territory, as if that would then have justified what happened to them. In fact, they were not. Ashrawi repeatedly scornfully rejected the BBC’s questions, asking why they were not asking questions about Israeli undercover soldiers’ operations in the territories, and killings of Palestinians. Finally, she made her own position in relation to the lynching incident she too had seen on TV. She refused to condemn it, and uttered a chilling declaration of solidarity with the lynchers. Today, she said, I am one of the people. Secondly, it rapidly emerged that overseas camera crews had been pressurized and sometimes directly threatened by members of the Palestinian Authority administration to either destroy or not show footage of either this incident or other incidents of violence, including intra-Palestinian violence of an horrific nature, and celebration of terrorist suicide bombings. This re-emerged as a “feature” of Palestinian Authority news management that has continued to this day, and was specifically lined up for the purposes of suppressing footage of Hamas violence during the period before, during and after the disengagement. Moreover, there was no shortage of contrasting outcry in Israel about the killing of Mohammed al-Durra, to say nothing of related outcry about other controversial killings of Palestinian bystanders. The Israeli government apologised for the killing but subsequently contested Palestinian claims that the killing of al-Durra was deliberate, and tried to present a case that he could have been killed by a stray Palestinian bullet. This was never taken seriously by such key Arab media as Al-Jazeera. The killing of the boy has been repeatedly openly used in pro-Palestinian propaganda, in a way that the Lynch has not. You do not see Israeli wall posters commemorating the Lynch or the memories of the soldiers who were murdered. Disengaged, by Gil Beckerman, is an unusually detailed analysis of the role played by the Israeli press in the recent Gaza disengagement. As such, it’s well worth reading. It’s the only published online analysis I’ve seen so far, though he acknowledges and draws on the work of Daniel Dor, who has recently published research analysis of the Israeli press treatment of the post 2000 Intifada. That makes it particularly interesting in the UK context, because Dor just played a role in the very recent conference “Fear of the Other”, designed to fuel up, organize and provide the ammunition for the latest variant on anti-Israel campaigning in British universities. A new focus is emerging on campaigning to represent Israel and the Israelis as unreasonably blocking peace by refusing to negotiate with the Palestinians. Such blocking is being represented as the product both of supposedly pathological attitudes on the part of Israelis, claimed to be the results of “orientalism”, obsession with the Holocaust and failures of responsibility on the part of the Israeli press. These failures supposedly create and continually reinforce the “fear of the other” and “instrumentalize racism” in the Israeli-Palestinian conflict. Partnerships for peace always sound like a wonderful idea. But it’s also possible to view all this peace-campaigning as a series of morally coercive manoeuvres. The aim is to put pressure on Israel and the Israelis to drop their insistence that the Palestinian Authority dismantle such terrorist movements as Hamas, Islamic Jihad and the Al Aqsa Martyrs Brigade. Beckerman revealingly depicts the perspectives of the proprietors and/or editors of two of the most influential Israeli newspapers, Ha’aretz and Ma’ariv, as well as of such internationally known journalists as Gideon Levy and Nachum Barnea. Beckerman argues for a sort of original sin of the Israeli press: its complicity in accepting Ehud Barak’s supposedly false view of the breakdown of the 2000 Camp David accords as being solely the fault of the Palestinians. From that time, Beckerman argued, the Israeli press abandoned its traditional critical vigilance and responsibility to expose wrongdoing on the part of the government vis a vis the Palestinians and in relation to the personal probity of Israeli politicians. He argued it ultimately mobilized to help Ariel Sharon bulldoze through a disengagement policy which in his view was an unjustifiably unilateral process. He hints at Sharon’s “deeper motives” and “long term strategy”, subsequently hinting that this might be to hang on to the West Bank. In doing this, Beckerman ignores speeches made by Sharon already conceding that large areas of the West Bank may be given up. According to him the Israeli press created the climate of widespread national support amongst Israelis for the disengagement. More importantly, it ampiflied and perpetuated the view amongst Israelis that there’s no hope of achieving peace because the Palestinians are irredeemably untrustworthy and don’t want peace anyway. With the new university term getting underway in the UK, it seems there's new vigour in renewing discussion about what is going to happen about the merger, and about the aftermath of last term's AUT boycott debate. Engage has now expanded its campaigning presence. Today, there is a new Engage web site, which will include a journal. The previous Engage blog is now called a Forum. I have quite a lot to say about Engage, and it will run into several posts. But in this post, I want to take up one of Jon Pike's proposals for developing what gets called "solidarity with the Palestinians". This particular concept looms large in both AUT and NATFHE discussions of the Israeli-Palestinian conflict. Both unions are currently committed to it. It is usually treated as an unproblematic, self-evident concept. Jon does acknowledge that "solidarity with the Palestinians" can be problematic. I have already demonstrated that in the case of the Palestine Solidarity Campaign, to which NATFHE is affiliated, it involves advocating and enforcing a total boycott on all contacts with Israeli goods and services, including cultural services. It allows only for contacts with Israeli organizations (such as trade unions) and individuals (any individual Israeli academic, student or just plain Yosef Average) for the purpose of opposing the occupation. Jon Pike has a number of suggestions for solidarity-with-the-Palestinians. One which looms large in the article I've linked to on the Engage Forum, is to affiliate to the Friends of Al Quds Medical School. Not only does it (and as far as I can see) the rest of the web site make no acknowledgement of the existence of Israel other than a reference to "this has to be appreciated considering the dire and despicable circumstances that all of us at the faculty are enduring under the brutal and oppressive Israeli occupation", or the fact that "Palestine" is not an existing state, or that Jerusalem is a city with many hospitals whose existence this site doesn't acknowledge, it seems to be in denial of any Palestinian agency or responsibility for the situation it finds itself in. "New check-points are suddenly constructed overnight and the cross roads in Abu Dies are extremely difficult; both teachers and students are faced by armed soldiers and frequently increasing barriers. It takes great resourcefulness to get through to classes. Some of the students have been harassed and arrested going to their work at Makassed hospital and warned of future imprisonment if they continue. Taxis are fined heavily if found carrying anyone under 25 and walking presents a constant danger. " "It is FQMS funding of these teachers that helps them to survive in their harshly occupied country where survival is now a great challenge for all. " Really? All Palestinians find it a challenge to survive? What evidence is there of this? It again makes it sound as if Israeli "harshness" is a purely gratuitous characteristic applied against victims who are just trying to stay alive. And that's in the city of Jerusalem. I wonder what the death rates are of Palestinians failing to survive when not involved in either direct "action" by Palestinian terrorists or Israeli responses to it? Last time I was in the Old City of Jerusalem, where this hospital is, (December 04/January 05), the Muslim and other non Jewish quarters seemed to me to be calm and living their lives much as the people in the poorer districts of Jewish Jerusalem. "Unfortunately one flat in Hebron was destroyed by soldiers a few weeks ago, as a wanted man had been living in a lower apartment in the block. Our students had a few minutes to leave the building in the night. We are told a new refuge will be available for them very soon. Now, with curfews imposed in Abu Dies, and the students being constantly threatened or arrested in the area..."
Once again, this medical charity presents Israeli soldiers as apparently gratuitous destroyers, acting against a "wanted man". Oddly enough, there's no hint about exactly what this man is wanted for or why a flat might have had to be "destroyed" in order to apprehend him. What view should we take on on that? I can certainly imagine London Islamists presenting similar pictures of the mayhem caused by police in certain flats in the Bowes Park area as a result of their pursuit of "wanted men following the July bombings in London". This charity, and, I presume, its associated hospital appears to be dedicated to "the dream---training of Palestinian doctors in Palestine by Palestinians". In other words, it seems to reject any involvement of medical co-operation with Israelis, even to the extent of seeking to raise funds to pay for hugely expensive overseas placements rather than support its students building towards peace by working with Israeli medics. And that's money that could be spent directly on patients. Does this hospital also refuse donations of "Jewish " blood from Magen David Adom or other Israeli medical facilities? Does their political stance take precedence over the saving of Palestinian lives? Meanwhile, in the very same Jerusalem is Shaare Zedek hospital, a religious Jewish hospital that has as its founding principle a commitment to giving equally high care to all patients including Arab and Jewish ones. It welcomes co-operation with the Jordanian Red Cross, whose representative is reported as saying that his East Jerusalem driver told him it was known to be the best hospital in Jerusalem for all its residents. This is a hospital I have donated money to for that reason. But it seems that the Friends of Al Quds Medical School doesn't want any mention of this Israeli medical co-operation with the international Red Cross and Red Crescent organizations. It's strange that we get a very different picture from the "brutal harshness" and "oppression" we get from the medical charity Friends of Al Quds Medical School. I wonder if we'll ever see any evidence from the Friends of Al Quds Medical School of any sort of Palestinian malpractice-- medical, political or otherwise? Now here's an idea for Ken Livingstone to copy. Rinat: Good night, I'm sorry for the late time, but I'm looking for Mr. Uri Lupoliansky. Rinat: Ah no? Do you have any mobile number in which I can reach him? Woman: No, I don't. Who are you. Woman: Would you like to leave him a message? Rinat (carrying on being a bit rude): I'm really sorry for the call, I know it's late, however I'm just a pissed citizen who pay my taxes according to the law and if I can't sleep at my own home, I guess it's not fair to let the mayor sleep too. I saw the article on last weekend's paper, got your number and I think I'm using it for a good reason. Woman: Did you call 106? Rinat: Sure, I called three times, there's a formal complaint there and the city hall already confirmed that the workers can carry on until 23h. Only. They are just working now against the law. Who can stop these machines? I want to sleep and I can't stand this anymore! Woman: Ok, I'm gonna tell the mayor. Rinat (the most ironic in the world): Thank you very much and I just hope you can sleep well and tight. Again, I'm sorry for bugging so late. And half an hour later, to her absolute amazement, the Mayor actually turns up at the construction site, surrounded by his bodyguard, and gets the noise to stop. Now, some of you may feel that Ken Livingstone might have some difficulty in following the example of an Israeli city mayor. He seems to take quite a dim view of Israeli zionists. But he could look at it this way. Uri Lupoliansky is well known to be a religious fundamentalist. And he famously opposed a gay pride parade being held in Jerusalem, in response to demands from Muslim, Christian and Jewish religious leaders. Sure, Lupoliansky doesn't actually think gays should be executed, like Ken Livingstone's hugging friend, Sheikh Yusuf Qaradawi does. But I think Ken could be a bit big-hearted about this, don't you? After all, he famously circulates newsletters bearing his image to us Londoners at our expense. I had forgotten how much I love being here. It's easy to do - I find I usually adjust fairly rapidly to where I am, be it London or Jerusalem, but sometimes when walking around the Old City I stop and look round and think "I live here", and then I end up walking off grinning to wherever it was I was going. I'm hooked on the wildlife again. True, the cockroaches in our apartment were less than pleasant and I wasn't going to rhapsodise over them (I may be strange, but not THAT strange! ), but I've been following the progress of the tiny sandy coloured geckos that run up onto the domed ceilings, but most of all I love the humming birds. I'd seen them when I was nine, but looking back on those memories I assumed I must have been mistaken and that I'd just seen a very large bee - but no, this shabbes there were several of them all clustered round the red tubular flowers in Hodaya's (one of our new Madrichot) garden. They were beautiful. Jet black with iridescent blue and green feathers around the head and throat. One of my favourite classes is Siyurim - we get to go around and learn the history of places, what happened there, what their significance is etc etc, and it's just like a weekly field trip. 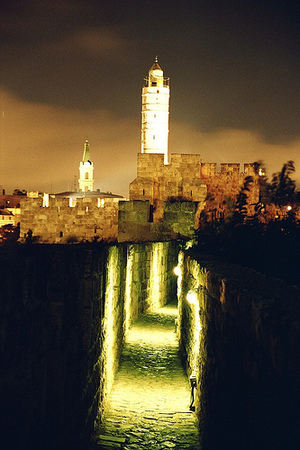 This week we left the confines of the Old City to go just beyond its walls to Ir David, the David Citadel. There are excavations there, so we looked around them, but the main attraction there are Hezkiahu's tunnels. The tunnel diverts a spring, then necessary due to the imminent attack on Jerusalem by Sancheriv [Sennacherib -ed], and was hewn out of the solid limestone from both ends, only meeting up in the middle - a crazy architectural feat. There is virtually no incline, it feels as if it's always level, but at time the walls and ceiling come in close to meet you and tell you that you should be more, well, my height [4'11"--Ed]! It was pitch black in the tunnels, and what's more, the water from the spring still flows through them, so were were wading in the dark up to our thighs in beautifully clear water. A few of us had brought torches. Rav L was leading us, and I was directly behind him, so I followed his rapidly fading silhouette surrounded by a faint halo of light into the darkness. Halfway through, we began to sing. Songs and harmonies to them echoed down the tunnels and linked the groups that had formed, some girls going faster (myself included) and some slower (the French girls). Finally, the light at the end of the tunnel and we emerged into a shallow pool with pillar stumps in them, the water slowly flowing away through a grate into beyond. One of my exciting buys recently has been a camera tripod. It came the day before I left, and so I hadn't really had any time to play around with it, plus I'd got it cheap off the internet so didn't know if it was up to much. It looked like it was good stuff though, so on Sunday night I thought I'd go and try it out. Talia asked me where I was rushing off to after sight seder, so I said I was going to go out onto the Ramparts with my tripod and take some long exposures. "Wow, cool, can I come?!" "Um, Tilla, how are we going to get onto the Ramparts?" "You just have to climb out over a drop and round the gate...you can also crawl under the gate if you want..."
I didn't want to give her any false illusions - it was only when we came to the gate that she really grasped what I'd been talking about. It's one of those metal one-way turnstile type gate/doors, with the interlocking bars on one side and a metal grid jutting out over a 20 foot drop. This really annoys me. The only way you can 'legally' get onto this part of the wall is by going round to the Jaffa Gate (dangerous at night), going through, paying a guy 16 shekels and then making your way up and around. It's the wall of the city, the entrance is in another quarter, and he doesn't own the wall! I therefore kicked off my sandals, put everything through the gate and climbed out on the grid over the drop until I was on the other side. Talia crawled underneath. The tripod worked a treat; it's brilliant, I think it's my new toy. I'll put the photos up as soon as I get them developed, you can see how they turned out. 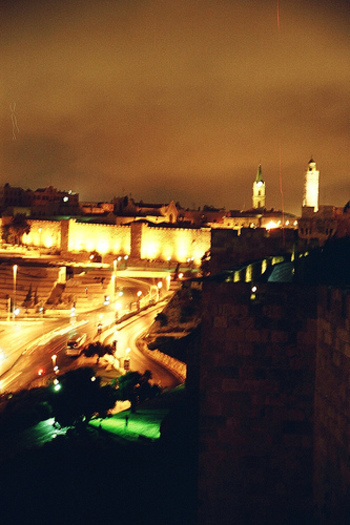 The Old City is really very beautiful at night. Every year the girls volunteer for various charities and organisations as a kind of 'good works' programme. Last year I was in the teacher training programme, so I didn't get to do it. This year however, is an entirely different matter. The choices for what we could do had changed drastically. I put down several choices, the first of which was working on an archaeological dig on the Mount of Olives sifting through excavated material from the Temple Mount itself. My second choice was cleaning gravestones - ok, I like graveyards - and no, not in a morbid "I like graveyards, they're dark....like my soul" kind of a way. I suppose it's because they're restful and feel abandoned most of the time, and they're very reflective places. Ah well. "Oh, did you read the notice? I guess not, because you're standing here - we're leaving in five minutes to go to the excavations on Har HaZeitim, make yourself a sandwich and get going!" In the panic I made myself a roast potato and shredded carrot sandwich (it was interesting) and ran to the minivan with Bracha who had also only just found out that we needed to be there NOW. More girls arrived surrounded by small clouds of panic, and eventually we left. We drove up and round to the Arab side of Jerusalem and then up to near where Hebrew University is. On a piece of empty ground they had set up canopies, and under these were the sifting trays and buckets of raw stuff to be sorted through. The archaeologist in charge gave us a brief on what was going on, what to look out for and how to identify it. The things we were sifting through had originally been dumped straight out onto a modern rubbish tip and so there was some modern dump material mixed in amongst the ancient stuff. It had come out from underneath Al Aqsa when they started to dig underneath it - they didn't want the rubble they took out, so just dumped it without sifting through anything, as they hadn't got any credible archaeologists with them. A group of archaeology students found out about this and started to sift through the dumped material and protest, raising media awareness. The students were promptly charged with looting ancient artefacts. Typical. The process was this - take a bucket of stuff. This stuff mainly consists of rocks, but you can't tell exactly what's in it. You then pour the stuff out into the sifting tray, spread it out, and blast it with the water jet in order to get the mud off. Don't spray the jet at your friend, no, DON'T...oh well, once you've done that, you can start looking through what you have. The categories to collect are ceramic, bone, metal, glass, mosaic and 'interesting rock'. Anything else is put into wheelbarrows and is carted off. Innumerable bits of ceramic, some ancient from small round glazed pots, large amphora type vessels, bits of oil lamp, etc etc, and my star find, a teacup handle - it was green...and yellow...and very modern, but I still had to put it in the 'finds' bucket. 10 mosaic cubes - these are the most fun, you sort through all of the rubbishy looking rocks to get to these cube shaped ones that are like very large dice and which it's surprisingly easy to miss. Nothing earth shattering, but I had so much fun, and I really like sifting through it all, it's strangely satisfying, plus the fact that it's from Temple Mount is even better. And now, it is time to go (I took long enough getting to it! ).